Acivir Cream (Acyclovir) is a topical antiviral cream which is used for herpes infections, including genital herpes, cold sores, herpes zoster (another name for shingles) and chickenpox. Acivir Cream (Acyclovir) is a topical antiviral cream which is used for herpes infections, including genital herpes, cold sores, herpes zoster (another name for shingles) and chickenpox. The active ingredient in this cream is known as a synthetic nucleoside analogue, and its mechanism of action involves inhibiting the activity of an enzyme (known as DNA polymerase) that the herpes virus needs to spread, which in turn prevents the multiplication of the virus. Although it can help to heal sores, blisters or other symptoms of a herpes infection, it will not cure the virus. 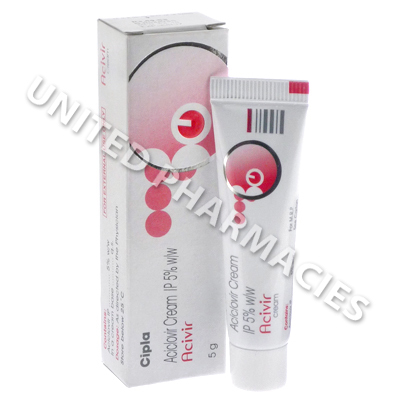 Acivir Cream (Acyclovir) is applied topically, exactly as directed. Patients who are treating herpes simplex labialis (cold sores) may be instructed by a doctor to apply it to the area requiring treatment 5 times per day, and treatment may last for a period of 4 days. Treatment usually commences as soon as possible after symptoms present themselves. Adults treating herpes simplex are sometimes told to apply the cream to the affected area at 3 hour intervals, 6 times per day, and it is possible that treatment may need to continue for 7 days. In all cases, the instructions of the doctor must be adhered to. If any side effects which are serious occur, immediate medical treatment will be needed. This cream is for external use only and should never be ingested. Patients with HIV or AIDS must inform their doctor of their condition before starting treatment with this medicine. Always use Acivir Cream (Acyclovir) as you have been prescribed by your doctor. Never self-medicate or change your dosage without first consulting your doctor. The correct dosage can vary depending on your health, medical history, and the severity of the condition being treated.